A stained birch quaint Russian Arts & Crafts/Folk Art wall hanging cabinet, typical of the better output at the time of their Peasant Art Industries; c1900. Notable centres such as Princess Maria Tenischeva’s estate at Talashkino, the Abramtsevo Workshop (of Elena Polenova fame) and nearby Sergiev Posad, all produced such furniture & decorative arts. 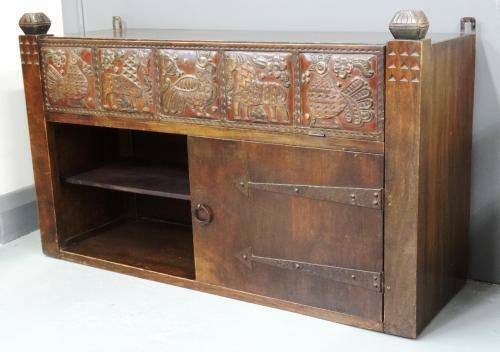 Pull down upper flap with typical naieve folk art carvings of horses and cockerels, above an open shelved section and a corresponding closed cabinet section with simple Arts & Crafts strap metalwork hinges. Old partial English price label of £6 6s to rear; indicating that it may well have been retailed through the Theosophist Madame Pogosky’s shop, “Russian Peasant Industries” at 41 Old Bond St (now Cartier) in London circa 1900. The shop was a very fashionable focal point at the time; partly due to the influence of the Ballet Russe.